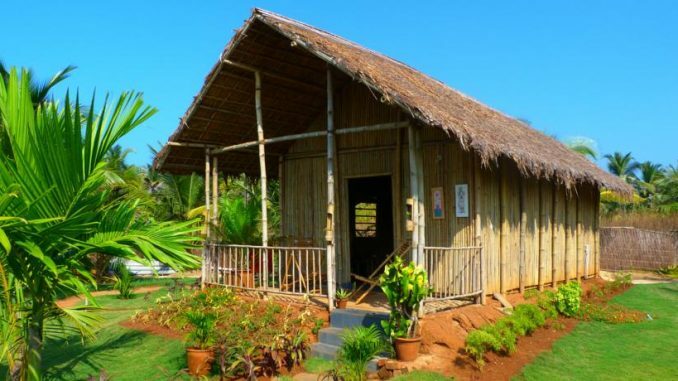 A decade into Bamboo House India, their initiative of promoting green livelihood through the construction of bamboo houses across the country, entrepreneur couple Prashant and Aruna Lingam are broadening their purpose through the Recycled India initiative. Using disposed tyres, PET bottles and several discarded articles, they are now reviving open spaces, building bus stations, dustbins for every kilometre besides seaters at parks made of drums and tyres. Prashant Lingam talks to us on his mission after returning from an extensive talk at IIIT Hyderabad on a weekend morning. Prashant’s team is currently preoccupied with the development of aesthetically designed tyre-pots and seaters that can be used across offices, homes and other spaces. There are negotiations to build such fancy furniture for TSRTC and APSRTC buses whose lifetime can stretch close to 800 years, Prashant asserts. Their successful implementation of building dustbins for every kilometre using drums (from factories that dump them) across Secunderabad in the last couple of years has also got many collectorate offices sending feelers to implement similar initiatives in their zones. They plan to expand their pilot project of a bus shelter at Uppal made out of discarded pet bottles across other areas. Prashant is in talks with bureaucratic bodies about its implementation and funding. “Many have asked us if the bottles will melt due to heat in the summers, we’ve done enough research to confirm that it won’t. While constructing bus shelters amounts to lakhs, this happens at a cost of ₹ 60,000-65,000. We plan to reach out to businesses across the city to collect discarded pet bottles and implement this on a wider scale, while we mention their contribution at the bus shelter. Companies are keen to do such work from their CSR wing,” Prashant adds. On the Bamboo House front, he has received several requests to build co-working spaces, tent houses and gymnasiums made out of pre-fabricated bamboo (made out of a bamboo board that they buy from the north-eastern regions) that’s resistant to weather changes. More attractive has been their cycle entirely made out of bamboo, that was launched amid widespread appreciation at the recently concluded Design Summit 2017. For every bamboo house that Prashant’s team constructs, about 100 people, directly or indirectly find employment. They aim to construct close to 100 houses a year for the future.